Given the resourcefulness of Sherlock Holmes pastiches, it was only a matter of time before Holmes, whose posthumous career has paired him with figures from Sigmund Freud to Jack the Ripper, met Father Brown. After an entertaining but detachable prologue in which Holmes neatly solves the disappearance of a storied ruby from his old Oxford college, he returns to Baker Street on Christmas 1902 to an urgent summons from Inspector Lestrade. Inspired by the example of the 1893 Chicago Exposition, the Archbishop of Canterbury has arranged a secret meeting of some of the world’s leading clergymen—Roman Catholic, Eastern Orthodox, Jewish, Hindu, Muslim, Buddhist—in St. Thomas’s Church, Kensington, in preparation for a possible World’s Parliament of Religions. Now that the mutilated body of St. Thomas rector Rev. Paul Appel, has been found in the church, all the illustrious guests have become suspects in his murder. Suavely overriding the visitors’ protestations that they never could have had anything to do with such an outrage, Holmes—with strategic assistance from Father Brown, on hand as a translator for the Vatican representative—methodically unveils their deceptions in the course of a wild Christmas night as he wades through a further series of murderous assaults to unmask a clever, sacrilegious plot. 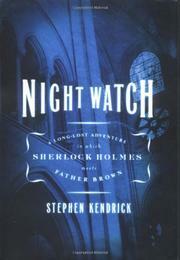 Universalist minister Kendrick (Holy Clues: The Gospel According to Sherlock Holmes, not reviewed) has scant opportunity to bring his eminent suspects to life, but he shows an intriguingly complex Holmes, rough edges softened by a healthy respect for religion, but still active enough for the requisite heroics.